My grandfather was born in Indonesia — Java to be precise. His father was a Dutch engineer building railroads there in the early years of the 20th century. Much later, my father was born in Amsterdam. It’s a city I love for all the right reasons. I go there often to visit my cool cousins, soak up Old World atmosphere and architecture, and, of course, eat great food. If, like me, you’ve explored that city’s restaurant scene, you’ll know that the Netherlands’ earlier colonial interests are well-reflected in its many Indonesian restaurants. 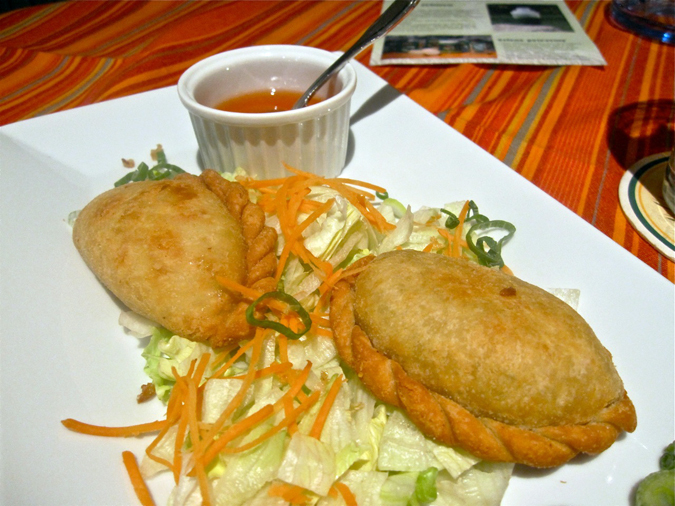 Love of this cuisine was certainly inherited by me through family tradition, if not genetics. My favorite Indonesian restaurant, partly for personal reasons, is Sama Sebo. 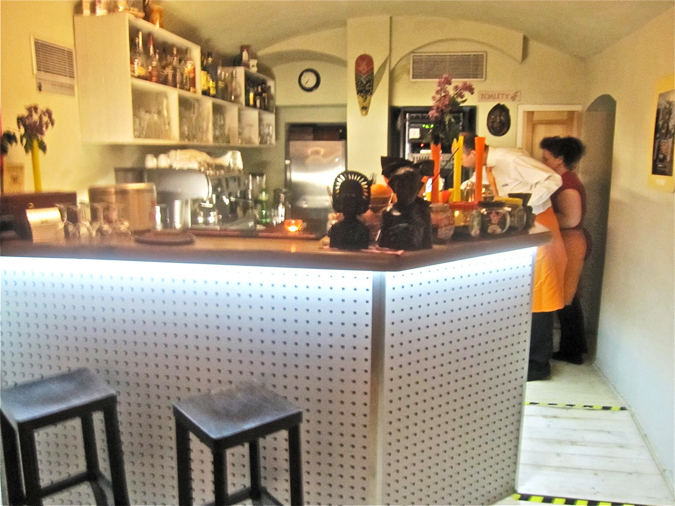 I wrote about it in my post on Amsterdam food favorites. 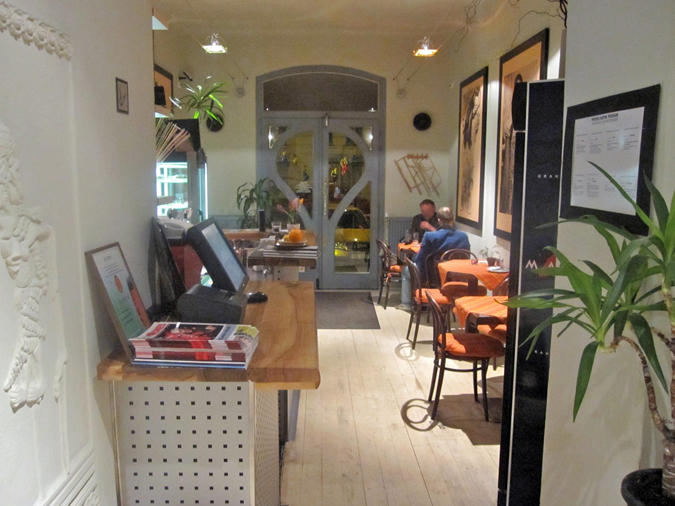 When I heard the Indonesian restaurant, Jáva Café & Restaurant, had opened late last year near Náměstí Míru, I was all kinds of excited. My Friend and I entered through the small upstairs section of the restaurant. This area is non-smoking and not much to look at. 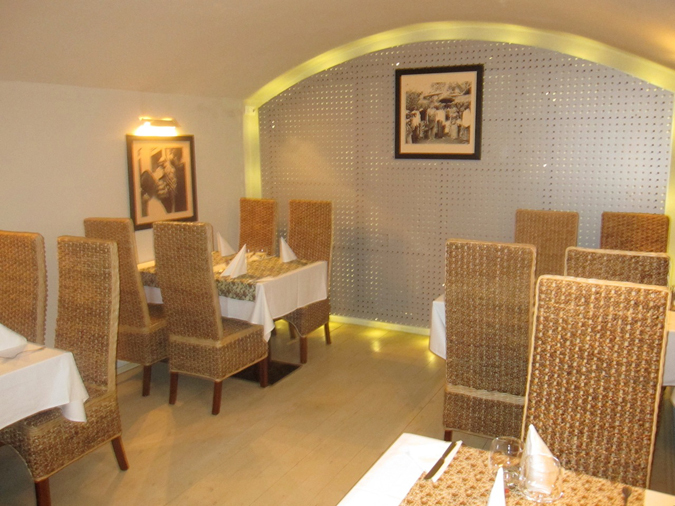 The subterranean dining area is easier on the eyes, with Indonesian decorations. There are comfortable padded and wicker chairs. There are smoking and non-smoking sections, but it should be noted that they are quite close together. I started with a half-liter of the Rohozec Skalák Řezané 11° (35 CZK). 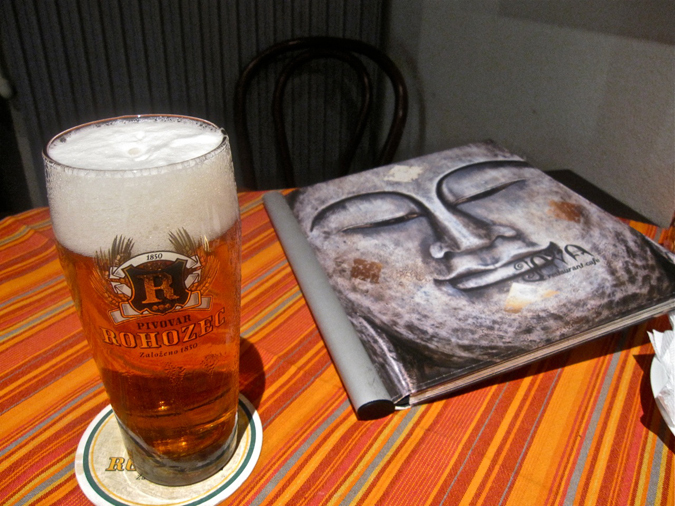 It’s a nice beer and was a nice break from the usual brands available in Prague. 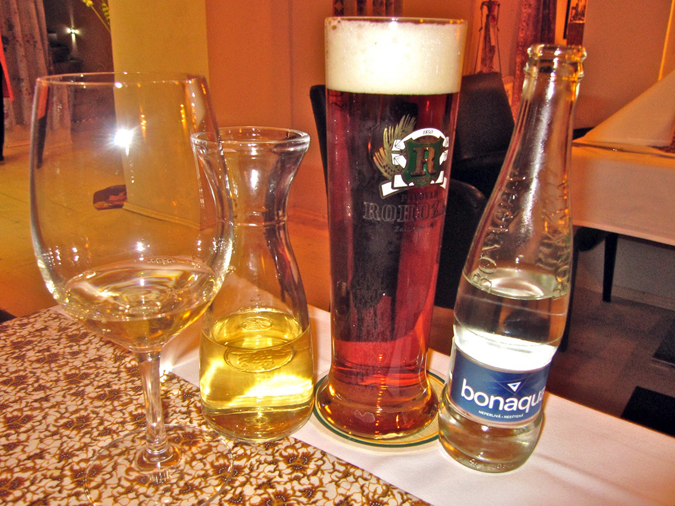 My Friend had a glass of white wine (82 CZK) and Bonaqua water (35 CZK). 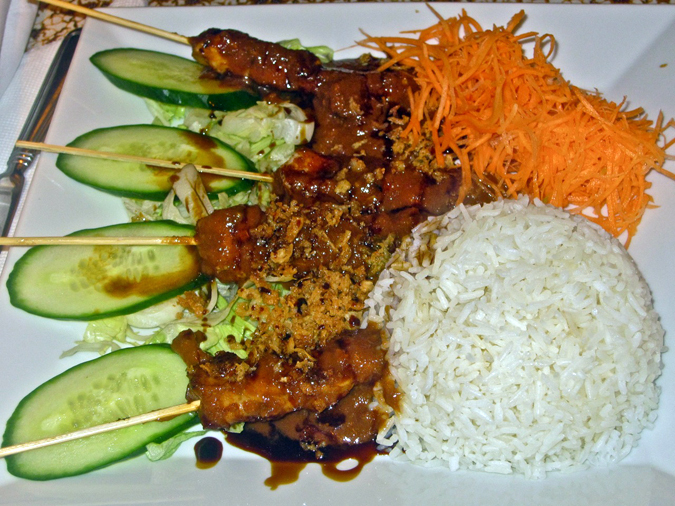 I wanted to try some classics, so we started with sate ayam (149 CZK). This was OK, but nothing special by my standards. The chicken was tender and well-prepared. The peanut sauce was on the thin and salty side. There was an awkward moment before it was delivered when the waiter brought me a spoon. “What is this for?” I asked. “Really, I didn’t.” The waiter looked very unhappy and took the spoon away. Of course, it was a simple misunderstanding, but the vibe felt tense, defensive, and awkward. 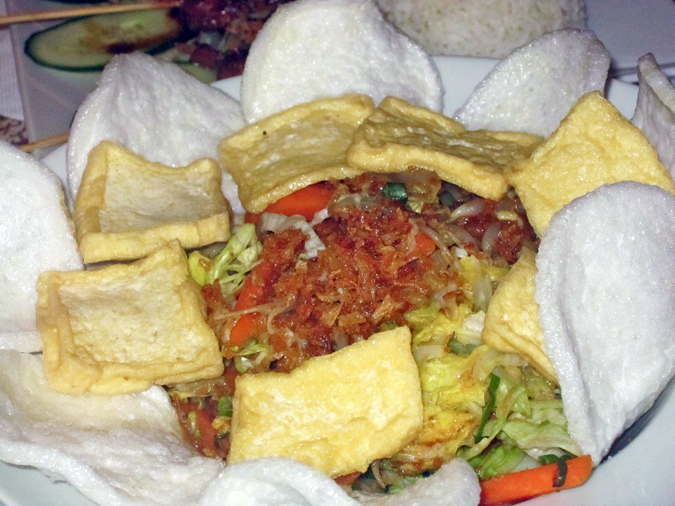 I also ordered the lontong gado-gado (159 CZK) as a starter for us to share. I’d had a variety of versions of this dish before and was curious how Java’s would be. I wish I hadn’t. The ones I had enjoyed in the past had a thick, rich peanut sauce that sat on top. Most of the sauce on this one was thin and salty and filtered through to the bottom of the bowl. What stayed on top soaked the crispy fried onions, turning them soggy. The bowl also contained cabbage, sprouts, and carrots cooked to a mushy state. It tasted rather unpleasant. The fried tofu on top was bland and virtually unseasoned. Neither I nor my guest had any interest in eating more than a few bites of this dish. Of course, there may be different interpretations, but when I have had gado-gado in the past, it contained boiled egg and potato. Neither was present in this version. Wikipedia says that carrots are not consider part of an authentic recipe. Also, if you Google gado-gado for images, the vast majority of dishes look much better, with thicker sauce. 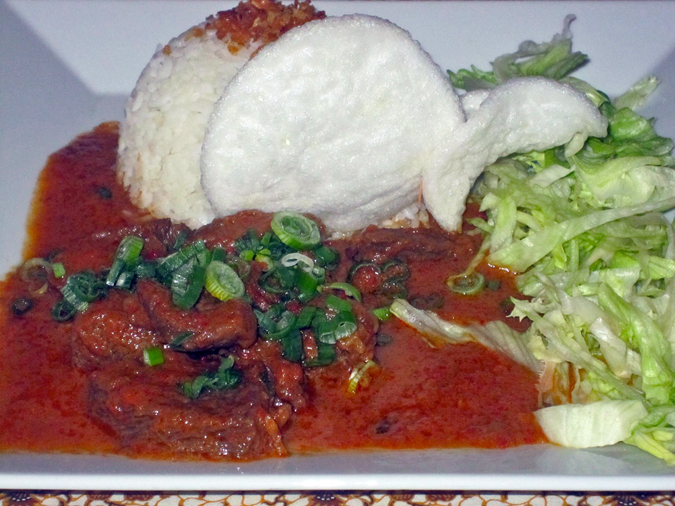 For a main course, I had the beef rendang (199 CZK). I had a great version of this dish recently at Sansho. Jáva’s was far more pedestrian. The flavors of ginger-like galangal (or perhaps just ginger) and lemon grass dominated the thin, salty sauce. But what stands out most in my mind here was the quality of the beef, or the lack thereof. The meat is supposed to be slow-cooked for many hours until it reaches a state of extreme tenderness. This beef was still tough and chewy. I didn’t finish it. I also thought the lettuce on the side of the plate was a useless addition. My friend had the semur (189 CZK). This was sweeter and the meat was more tender. It also had a ginger-like flavor. We agreed this was better than the rendang, but didn’t really excite either of us. The meal left us both disappointed. My Friend, an Indonesian cuisine novice, seriously disliked the dinner. I, far more seasoned, wasn’t thrilled either. 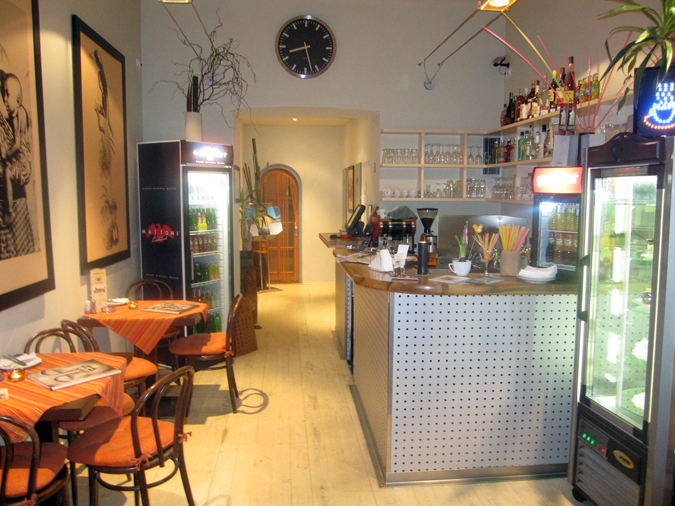 The bill was 965 CZK before tip. I returned for a second solo visit a few days later. I ate in the upstairs section. Techno music played on the sound system. I drank the Rohozec Skalák světlý ležák 12° (35 CZK). 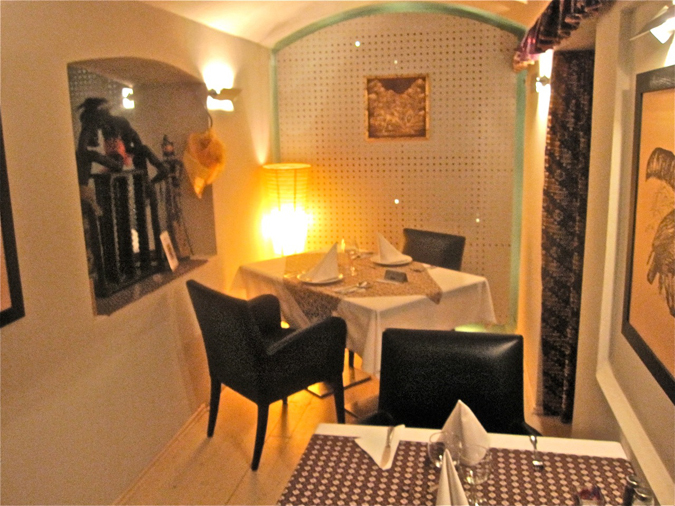 For a starter, I got the pastel (89 CZK). 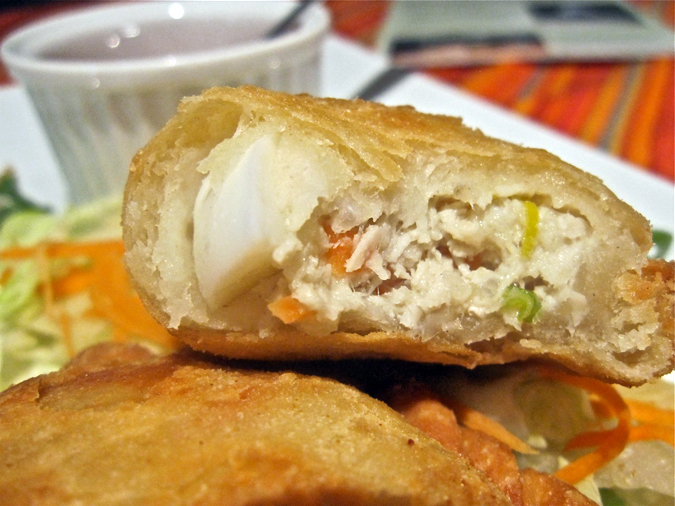 There were two flour turnovers filled with minced chicken, vegetables, and boiled egg. It was lacking in seasoning and boring. The very sweet chili sauce on the side masked the blandness, but made it rather generic. My main course was the mie goreng ayam (139 CZK). This didn’t work for me either. The chicken was decent quality, and the vegetables were not as overcooked as in the gado-gado. But I really couldn’t detect flavors that would qualify this dish as Indonesian or even Asian. What struck me about this version was the white noodles. 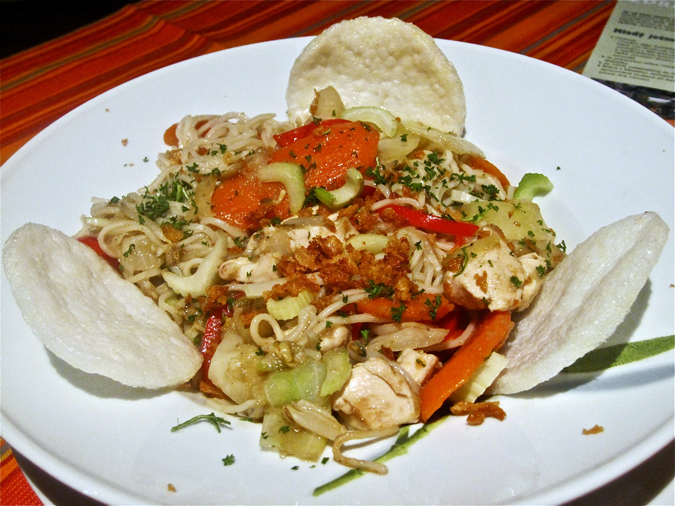 With almost every version I’d seen before, including those on Google images, the noodles were brown, due to the addition of a sweet soy sauce called kecap manis. I didn’t taste it here. I didn’t finish it, but took it home and added some Heinz Soja sauce. It made a big improvement. The bill for this meal was 263 CZK before tip. 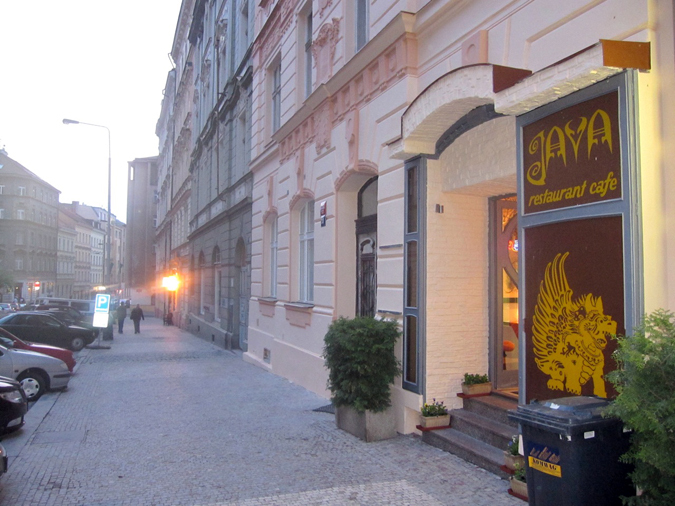 I had already eaten my two meals at Jáva when I saw that The Prague Post had slammed and panned the restaurant. I have to say I agree with that assessment. I had such high hopes for a real Indonesian place with high standards. 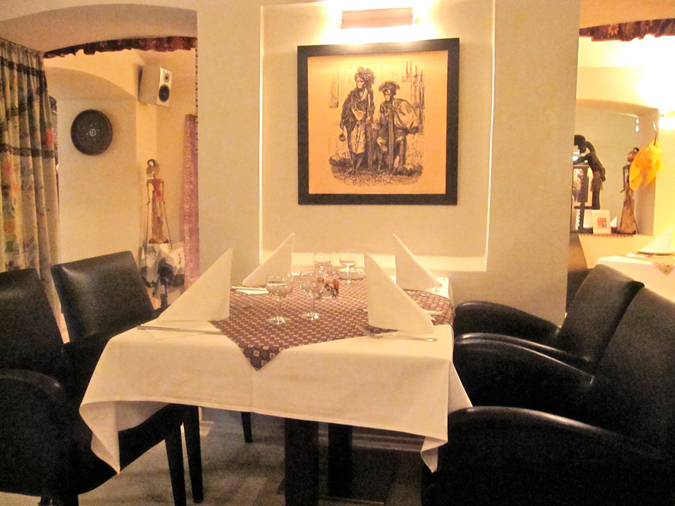 Instead, the cuisine tasted “Czechonesian” and I was very disappointed. I was also disappointed to see the restaurant’s counter-attack against The Prague Post on the Jáva Restaurant Facebook page. They posted a comment suggesting some type of extortion scheme or protection racket where restaurants that don’t advertise with the paper are more likely to get a bad review. I understand that having your business and creative efforts heavily criticized in print has to hurt and would naturally provoke a defensive reaction — perhaps as much as spending hard-earned money and an evening on a meal you don’t enjoy. But serious accusations in absence of serious proof are over the line. They also went on to say that they’ve cooked for the Dutch and Indonesian embassies and staffs and had many satisfied customers. That may or may not be the case. I can only speak for myself. 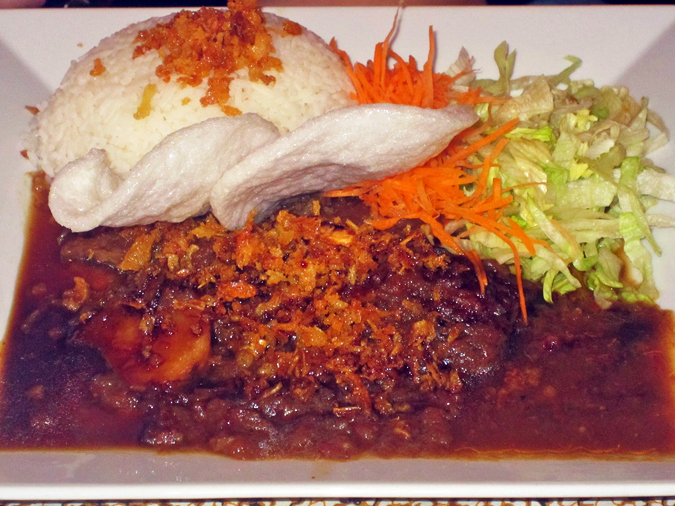 I’ve eaten at plenty of authentic Indonesian restaurants and this food did not come close to meeting my expectations. The prices at Java may be reasonable, but I didn’t like my meals, and I won’t be making any future visits. I’ll have to be content with remembering some of my great Indonesian meals of the past.